Montreal Canadiens legend Jean Bealiveau has passed away at the age of 83. The Canadian professional ice hockey player who played parts of 20 seasons with the National Hockey League’s Montreal Canadiens. As a player, he won the Stanley Cup 10 times, and as an executive he was part of another seven championship teams, the most Stanley Cup victories by an individual to date. He was inducted into the Hockey Hall of Fame in 1972. Jean Béliveau was born in 1931 to Arthur and Laurette Béliveau, the oldest of eight children, in Trois Rivières, Quebec.A star at an early age, he was spotted by Canadiens general manager Frank Selke at the age of 15. By the time he went to play for the junior Quebec Citadels in the late 1940s, he was a 6-foot-3-inch man-child with the grace and deftness of a much smaller player. The first memories Béliveau had of the team he would eventually lead to 10 Stanley Cups were from sitting beside the family radio listening to games. In 1950, he was called to Montreal for a two-game tryout and returned for another trial stint in 1952. The club thought enough of Béliveau to make him the first rookie in Canadiens history to be offered a multiyear contract – worth a total of $105,000, an unheard-of sum in the day – and inserted him in the lineup that very night. After his playing days were over, in 1971, Béliveau remained with the Canadiens team as an executive and goodwill ambassador. 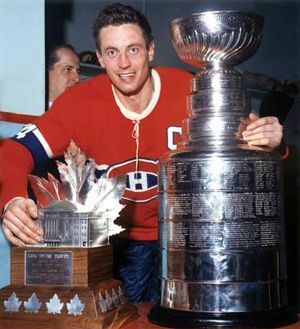 Béliveau’s name appears on the Stanley Cup a record seventeen times, including seven times as an executive for the Canadiens: 1973, 1976, 1977, 1978, 1979, 1986, 1993. Béliveau met his future wife, Elise Couture, in 1950 in Quebec City. They were married on June 27, 1953 at St. Patrick’s Church in Quebec City. They had one child together, daughter Hélène. Béliveau was given many awards including several honorary doctorates from Canadian universities, plus the Loyola Medal in 1995. He was made a Knight of the National Order of Quebec in 1988, promoted to Officer in 2006 and Grand Officer in 2010. On May 6, 1998 he was made a Companion of the Order of Canada, his country’s highest civilian award. In 2001, his name was added to Canada’s Walk of Fame, the same year he was honoured with his portrait on a Canadian postage stamp.